The new templates in the LexisNexis Firm Manager product enable law firms to choose from seven different invoicing themes. Invoicing, indeed the billing process overall cuts two-ways because the activity is non-billable but essential to law firm cash flow. LexisNexis® Legal & Professional, a leading provider of content and technology solutions, today introduced six new invoicing features within the LexisNexis Firm Manager® online practice management solution for independent attorneys. 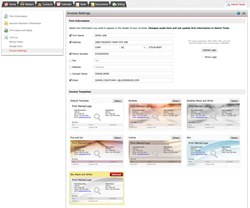 The new invoicing functionality offers a series of settings and templates that enable small law firms to efficiently create customized professional invoices that can include personalized messages and client payment history, plus the ability to email directly from within the LexisNexis Firm Manager application. In a recent market research study of small law firms, 62% reported spending eight hours or less per month on the billing process – another quarter reported spending between nine and 16 hours. More than half felt this was too much – 58% saying they felt like they were spending too much time invoicing clients. 1. Invoice settings. Invoice settings provide independent law firms control over the type and appearance of the administrative data included on a client invoice. In addition, a law firm logo can easily be uploaded to the Firm Manager system and added to invoices for a more professional and polished look and feel. 2. Template options. The system offers seven distinct invoice templates to choose from – providing lawyers or staff with the option to select a theme that matches the law firm’s personality. The selection process includes a preview feature providing a view of what the invoice will look like before it is sent to the client. 3. Column headings. Customizable column headings provide law firms with a range of options of what to include on invoices. For example, a typical law firm invoice includes the date, activity, bill rate, hours billed and a description on invoices. The Firm Manager product provides firms with the option to also include the staff member – for example a managing partner or paralegal – that performed the work. 4. Outstanding balances. This option allows the firm to include a “mini statement” on invoices. These statements provide both the client and firm with a complete view of invoices with outstanding balances and payment history. 5. Default messages. Firms can save time preparing and finalizing invoices by setting default messages that can easily be customized for clients on an individual basis. Similarly, defaults for the subject line and message body for emailed invoices can be defined. 6. Email directly from the system. The complete invoice, or invoices, can be emailed as a PDF to clients directly from the Firm Manager application. Law firms have the option to send a copy of the invoice email by way of BCC to an address of their choosing – for example to a general billing email address or to a specific staff member or attorney. To learn more about the LexisNexis Firm Manager product please visit http://www.firmmanager.com. LexisNexis Legal & Professional is a leading global provider of content and technology solutions that enable professionals in legal, corporate, tax, government, academic and non-profit organizations to make informed decisions and achieve better business outcomes. As a digital pioneer, the company was the first to bring legal and business information online with its Lexis® and Nexis® services. Today, LexisNexis Legal & Professional harnesses leading-edge technology and world-class content, to help professionals work in faster, easier and more effective ways. Through close collaboration with its customers, the company ensures organizations can leverage its solutions to reduce risk, improve productivity, increase profitability and grow their business. Part of Reed Elsevier, LexisNexis Legal & Professional serves customers in more than 175 countries with 10,000 employees worldwide. LexisNexis helps professionals at law firms and legal departments of all sizes manage the business element of their practice or departments with innovative software and mobile solutions for customer relationship management, time and billing management, matter management, client analysis, legal holds and more.